A lot of people look at customer reviews online before they make a purchase. After all, they're like vicarious test-drives: You get the benefit of previous users' experiences in deciding whether a product or service is worth the money or delivers what it advertises. The pre-purchase advice is great -- if you can trust the source. But often, you can't. In fact, many customer reviews are just another form of marketing controlled by the businesses you're trying to evaluate. 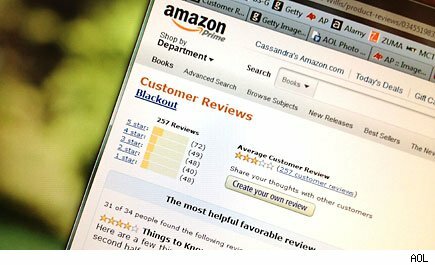 The problem is pervasive: A recent New York Times story highlighted a business called GettingBookReviews.com, which posts positive "consumer reviews" on websites such as Amazon.com (AMZN) -- for a fee. These fake customer reviews say exactly what a book's writer would want them to -- that the book was amazing, of course. Soon after starting his business in 2010, owner Todd Rutherford was raking in the orders and making about $28,000 per month. That's just one example of marketers muddying the customer-review waters to market products. According to data-mining expert Bing Liu, approximately one-third of online consumer reviews are written by marketers or retailers, not real consumers. Don't believe it? Consider this: Amazon customers are rating new books higher than renowned classics. How can this be? One self-published writer, Roland Hughes, suggests it's because "[r]eviews for the established classics tend to come from actual readers." Although it could be argued that more people are reading contemporary books than classics. Fake customer reviews aren't unique to Amazon. A few years back a PR agency got into trouble for allegedly breaking the Federal Trade Commission's truth-in-advertising laws by paying employees to post favorable reviews of their customers' games on iTunes without disclosing that doing so was part of their job. Other companies are trying to crack down on outsiders' attempts to abuse the customer recommendation system. For example, Facebook (FB) recently announced that it was cracking down on "likes" that were "gained by malware, compromised accounts, deceived users, or purchased bulk Likes." TripAdvisor (TRIP) has also warned customers that some of its online reviews may be fraudulent, and is exploring methods for detecting and eliminating fake reviews. In addition to warning customers, these companies are enlisting the help of data-mining experts to help them create algorithms that can aid them in the discovery and elimination of bogus reviews. These algorithms assist consumers by looking for clues most of us are too busy to find on our own, such as semantic inconsistencies between posts from the same user name, or how frequently a user evaluates products. Product reviews can have a strong impact on our purchasing decisions because humans have a natural tendency to look to others for signals about how to behave. If someone else praises an item or service, we're more likely to think it's worth our time and money. Fortunately, there are ways to spot those fakers, and defend ourselves from their influence. One study, conducted at Cornell University, found that fake reviews focused more on narratives and relied a great deal on superlatives rather than providing concrete descriptions -- probably because fake reviewers rarely have actual experience with the products or services they evaluate. Suspect reviews also used the words "I" and "me" more frequently, perhaps to reinforce their credibility as "real" people. These study results suggest we should look for reviews that offer concrete descriptions about the product or service to determine whether it fits what we're looking for rather than simply relying on the communication of vague positive or negative impressions. Motley Fool contributor M. Joy Hayes, Ph.D., is the Principal at ethics consulting firm Courageous Ethics. She doesn't own shares of any of the companies mentioned. Follow @JoyofEthics on Twitter. The Motley Fool owns shares of TripAdvisor, Facebook, and Apple. Motley Fool newsletter services have recommended buying shares of Apple, Facebook, and TripAdvisor, as well as creating a bull call spread position in Apple.